In the Western Ghats range of mountains, there is a small town and hill station named Munnar which is located in Idukki district of Kerala. It is 5200 ft. above the sea level. The meaning of Munnar is "Three Rivers". It refers to location at confluence of Mudhirapuzha, Nallathanni and Kundaly rivers. Covering the area of 557 sq. kms the Munnar town is situated on the Kannan Devan Hills village in Devikulam taluk. It is the largest punchayat of Idukki district. In past time this hill station was once a support for british government in south India. This resort provide many facilities. These are tea plantations, picture-book towns, winding lanes and holiday facilities which make this hill station to a popular resort town. Except the exotic flora, Neelakurinji is also found in the forest and the grassland. In every 12 years these flowers bath the hills with blue color. 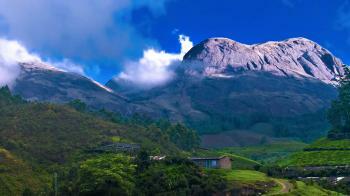 Munnar is also a highest peak in the south India about 2695 mt. To start the trekking Anamudi is an ideal spot. The temperature ranges between 5 °C and 25 °C in winter and 15 °C and 25 °C in summer. Temperatures as low as −4 °C have been recorded in Munnar. By Air : Cochin International Airport is the nearest airport to Munnar. By Rail : Aluva is the nearest railway station from Munnar. By Road : Kerala State Road Transport Corporation provides bus services to Munnar from all major cities in Kerala.